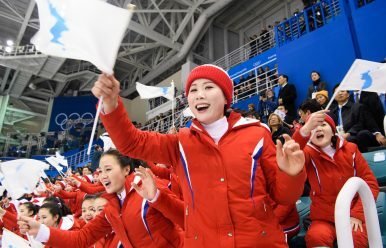 Cheerleaders from North Korea wave the Unification Flag during the unified women's ice hockey team's first Olympic match. South Korea’s liberals and conservatives have drastically different interpretations of North Korea’s Olympic outreach. The first weekend of the Winter Olympics in PyeongChang saw a flurry of notable activity and diplomatic signaling between North and South Korea, and the United States. This included the two Koreas walking together under a unified Korean flag, the widely reported handshake between President Moon Jae-in and Kim Yo-jong (director of the Propaganda and Agitation Department of the Worker’s Party of Korea and younger sister of North Korean leader Kim Jong-un), and U.S. Vice President Mike Pence’s overt disapproval of inter-Korean cooperation, repeated warnings against Pyongyang’s charm offensive, and a pledge that the United States will further tighten sanctions against the Kim regime. Most significant, though, was the Blue House meeting between Moon, Kim Yo-jong, and Kim Yong-nam (president of the Presidium of the Supreme People’s Assembly of North Korea, and often referred to as the North’s nominal head of state). Kim Yo-jong delivered a handwritten note from Kim Jong-un, inviting Moon to visit North Korea for what would be the third ever inter-Korean summit. Moon’s spokesman said afterwards that the president responded by saying, “Let’s create the environment for that to be able to happen.” Another Blue House official, however, said Moon “practically accepted” the invitation. Just as interesting as the events themselves, though, is how different groups in Seoul perceived them. Differing views on inter-Korean relations and the U.S.-ROK alliance, while not the only relevant factors defining partisan divisions within South Korea, remain important determinants for where one stands on the domestic political spectrum. Generally speaking, South Korean progressives support more open diplomatic engagement of North Korea and a more autonomous policy toward the United States, whereas conservatives remain deeply skeptical of engagement, maintain a hardline stance toward Pyongyang, and emphasize the overriding importance of unity within the U.S.-ROK alliance as the ultimate protection from a still threatening North Korea. These attitudes are born of distinct formative experiences and highly contested views of modern Korean history. It was during the ten years of progressive presidential rule under Presidents Kim Dae-jung (1998-2003) and Roh Moo-hyun (2003-2008) that the sharp conservative-progressive division over respective attitudes toward North Korea and the United States took on its greatest political and electoral salience. Kim Jiyoon’s research shows that more recently, particularly in the 2007 and 2012 presidential elections, attitudes toward North Korea and the United States have faded as important issues, being gradually replaced by domestic economic and social concerns, such as job creation and wealth redistribution. Nevertheless, disparate and ideologically contested perspectives regarding the longtime Korean “other” and Seoul’s American ally still carry weight, which is evident in the varied responses to recent events. Although there is no perfect proxy for measuring these perspectives (which are often quite complex and ambiguous in any individual Korean citizen, with important intergenerational differences as well), two newspapers, the Chosun Ilbo and Hankyoreh, are roughly representative of the simplified conservative-progressive spectrum outlined above. Looking at each newspaper’s editorial page, one quickly observes differences in how they view last weekend’s events, from the titles of the editorials themselves and their overall tone to the policy prescriptions they offer. The two periodicals offered starkly opposed views of the events and inter-Korean cooperation. Even before the Opening Ceremonies, the Chosun Ilbo took a highly critical view. An editorial titled, “N. Korea Keeps Trying to Weaken Sanctions,” argued that Pyongyang’s participation violated UN sanctions, specifically the travel blacklisting of North Korean officials such as Choe Hwi, and the Moon administration appeared intent to help them do so. Even allowing Kim Yo-jong to come, who is not on any UN blacklist but is on a separate U.S. Treasury list, “would flaunt international rules again.” The editorial stressed in dramatic language that Pyongyang’s actions are clearly aimed at driving a wedge between Seoul and Washington and warned that Kim Yo-jong’s visit “may be putting the final touches” on Kim Jong-un’s plan to weaken sanctions, the outcome of which “would be unimaginable.” In short, Pyongyang is never to be trusted. In a marked departure in tone, Hankyoreh published an editorial titled, “Pyeongchang Olympics are first steps toward peace on the Korean Peninsula.” Consistent with its hopeful title, the editorial made no mention of sanctions violations. Rather, it remarked that the visit represented “steps toward peace… in keeping with the Olympic spirit” and added that “We look forward to seeing Kim Yo-jung and Kim Yong-nam taking part in frank and sincere inter-Korean discussions.” Another Hankyoreh editorial, “Frank and serious discussions needed between South and North Korean leaders,” written after the Opening Ceremonies but before the Blue House meeting, noted the “sincerity and enthusiasm of Pyongyang’s approach to dialogue can be seen in the downplaying of its recent armed forces anniversary parade.” Although the piece acknowledged the importance of the nuclear issue and the need to address it, it adopted a far less skeptical attitude toward Pyongyang’s entreaties. The North’s efforts are not part of a duplicitous plan, as conservatives would have it, but genuine outreach. In this same vein, the first of the two editorials directly criticized conservative groups and political parties, such as the Liberty Korea Party, for undermining the spirit of the moment and possibilities ahead. Finally, both sides showed distinctly opposing views regarding the U.S. position and how Seoul should orient itself to it. Chosun Ilbo, consistent with conservative sentiment in general, praised Pence’s public circumspection regarding North Korea’s participation in the Olympics and said that Pence “rightly described” the Kim regime as “murderous.” It approvingly noted in the second editorial above that Pence and the United States are “wise to the ruse.” Furthermore, in another piece, “Joint Drill Must Resume After the Olympics,” it stressed the imperative of immediately restarting the joint U.S.-ROK military drills after the Olympics in conjunction with upholding sanctions, in line with the “maximum pressure” campaign. It did so while warning that the Moon adminsitration “is already losing its nerve over the resumption” of the exercises. Contrary to the Chosun Ilbo’s praise of Pence, the first Hankyoreh piece stated the “unfortunate and worrying part of this has been the U.S.’s attitude.” In particular, Pence’s remarks show an attitude “far divorced from the current climate.” It continued: “The U.S. will be hard-pressed to avoid being held responsible if its ignorance of this opportunity leads to the peninsula being plunged back into serious tensions.” Rather than follow the U.S. lead and remain wedded to its “maximum pressure” campaign, the Moon administration should take the “first step in getting the ball rolling…in mediating for dialogue between Washington and Pyongyang.” In sum, the United States, not North Korea, appears the prime suspect in the case events once again turn negative, and Seoul the prime mover fostering a positive future path. As is frequently the case, the same events elicit strongly contrasting interpretations due to the distinct and deeply rooted ideological positions from which they are viewed. In truth, neither interpretation is correct. Both present obvious blind spots. The conservatives’ view that Moon is ready to sacrifice national security and the U.S.-ROK alliance, eagerly free Pyongyang of its international constraints, and forgive it of its violations is simply absurd. Meanwhile, the progressive’s willingness to look past Pyongyang’s internal abuses and repeated external provocations, while absolving North Korea of its own agency in helping create the crisis, alongside placing much of the blame on the United States, is equally mystifying. The truth is somewhere in between, and the Moon administration faces the unenviable task of trying to locate it. The South Korean president has a rare chance to move forward with his hopes for inter-Korea relations.